While the 80,000-capacity Olympic Stadium will be the centrepiece of the London 2012 Olympic and Paralympic Games, a multitude of smaller venues will host sports throughout London and beyond. Swimming, diving and water polo will be held at the new, 17,500-capacity Aquatics Centre. The venue, designed by Zaha Hadid, features a wave-like roof that is 160 metres long and up to 80m wide. 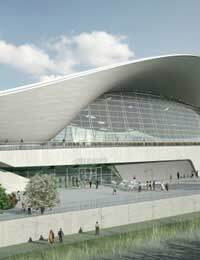 It will be the gateway to the Olympic Park, with more than two-thirds of spectators expected to enter the park over a bridge that runs over the top of part of the Aquatics Centre. The new, 6,000-capacity VeloPark in the north of the Olympic Park will host track cycling and BMX and should prove popular given Great Britain’s cycling successes at the 2008 Beijing Olympics. A glass wall will give spectators a 360-degree view across the Olympic Park and allow people outside the venue to see the action taking place inside. The Basketball Arena, near the VeloPark, will be one of the largest temporary venues built for any Games with a capacity of 12,000, while the temporary Hockey Centre will have two pitches with a combined capacity of 20,000. Handball, goalball and fencing competitions will be held in the permanent, 7,000-capacity Handball Arena in the west of the Olympic Park. The venue’s 3,000 square metres of external copper cladding – mostly recycled – will give it a distinctive appearance. It will also feature a glazed concourse level that will encircle the building, allowing spectators to view the sport taking place inside and illuminating the venue when lit at night. Earls Court will be turned into a 15,000-capacity volleyball venue and the 100-acre ExCeL London – one of Europe’s largest and most versatile exhibition spaces – will be transformed into four arenas to host boxing, fencing, judo, table tennis, taekwondo, wrestling, boccia and weightlifting. Equestrian events will be at Greenwich Park, with space for more than 23,000 spectators, and beach volleyball will be on the Prime Minister’s doorstep at Horse Guards Parade. With the triathlon and open water swim at Hyde Park, archery at Lord’s Cricket Ground - home to cricket since 1814 and a regular venue for both Test and one-day international matches - gymnastics, trampolining and basketball at the Millennium Dome, road cycling at Regent’s Park, shooting at the Royal Artillery Barracks, tennis at Wimbledon - the only remaining major grass-court tennis venue in the world - and football at the 90,000-capacity Wembley Stadium, events are truly being spread throughout London. But the sport is not confined to the capital city. Football will also take place at Hampden Park in Glasgow, Millennium Stadium in Cardiff, Old Trafford in Manchester, St James’ Park in Newcastle and Villa Park in Birmingham. A temporary mountain bike course will be built at Hadleigh Farm in Essex, while Weymouth Bay and Portland Harbour in Dorset will host the Olympic sailing. Canoe slalom will be at the new, 12,000-capacity Broxbourne White Water Canoe Centre in Hertfordshire and both canoe sprint and rowing, another discipline Great Britain has excelled at in the past, are at Eton Dorney, near Windsor Castle.